I just can’t help myself when I’m on the trains of how many more germs there are when the weather heats up. The first thing I do once I get off and reach my next destination is go to wash my hands as soon as I can. Luckily, I’m not the only one that feels this way as Method, the good people who make a wide range of household cleaning items from body products to loo cleanser, also has the motto: ‘ People Against Dirty’. They’re just as whimsical as me when it comes to cleaning my hands as they claim their hand washes get your ‘hands so clean you can eat with them’. Method’s hand washes are naturally derived and are also paraben-free. So for those of you out there who are obsessed with hand washing- feel free to indulge with minds at ease! Their trademark scent in the range is a scent called: ‘Sweet Water’. The Sweet Water scent consists of grapefruit + lemon leaves wrapped in watery petals of jasmine lily of the valley. Rumour has it that this scent is rather similar to what the fountain of youth might smell like. I’ve recently been addicted to a new and exclusive scent their selling at Boots: Fresh Current. It’s not an overtly juicy or sickly smelling scent at all. I feel it has all the right balance it with black currents, red apply, lily, jasmine and just a kick of tartness in the cherries. I’ve also found that this wash does not dry out the hands as others can but leaves them squeaky clean without stripping. When trapped on a train at 4pm in rush-hour your sense of smell may bring you places you don’t want to go to. Two thoughts always enter my mind: One being how bad most people smell and how I wish I couldn’t smell them, followed by how I smell to them. This is why instead of wondering either question I’ve opted out for SO…? body fragrances. A quick spray of this before getting on the train guarantees heads turning for the right reasons. Having just launched their Couture collection of body sprays (named after major cities: London, Paris, NYC & Rio) these scents are effortless and chic. My favourite is Paris which has playful notes of plum and rose with a twist of vetyver & patchouli. I’m not into cheap fragrances as you know, and you must be wondering why would I be wearing a chemist/drug store brand scent? Well, the people behind So…? Products are an established perfumer called Robertet who have been around since 1850. The Robertet story started with ‘a la confiance’ which means ‘trust’. They’re a company that started in the heart of fragrance: Grasse, and who want to inspire with dynamism. They’ve got companies worldwide in the USA, Argentina, Brazil, and the U.K, not to mention also Switzerland, Japan, Italy & Singapore with cutting-edge analytical facilities. There are some fabulous mini sets that are coming in for the Christmas season worthy of noting as stocking fillers or perhaps just popping in your hand bag to have at hand for the train. I suggest highlights such as the Kiss Me fragrance which has vanilla + musk entwined in a floral heart. Handcrafted luxury jewellery is hot at this moment, and Myriam Soseilos is championing this trend and trade with her ornate pieces that are inspired by modern architecture. Soseilos signature is to feature tiny gemstones that are hand-set. She has won multiple jewellery design competitions globally, and has won ‘Designer of the Year 2013 at Treasure,London’s visionary jewellery show (which took place at London Jewellery week in June 2013) for her ‘Transformers’ collection. While you’re thinking robots or the comics, her ‘Transformers’ collection consists of ‘transforming’ bracelets, rings, necklaces and earrings. The ‘SOS’ behind her name for her brand is pronounced ‘sauce’ in English, and represents the first three letters in her surname. From this pun she has developed the brand message: to provide the ‘sauce and spice’ to any outfit. I find her pieces to be timeless but at the same time modern to the effect of being able to wear for every day. There is an underlying message in her pieces where the bearer is able to silently state the strength in the expression of their outfit through their accessories. My most wanted piece? It has to be her ‘rubik’s cube’ ring, as it is sure to get a conversation going anywhere, and anytime. MyriamSOS is noted to be an upcoming designer to watch, and her pieces are available exclusively at:Wolf & Badger: https://www.wolfandbadger.com/search/?q=myriamsos Pieces start at £35 and run up to an average of £250 or more. While French retailers such as Sandros, Maje and now American brands like Kate Spade & J.Crew have been making waves on the ‘luxury’ side of things on the fashion high street, Italian Ki6 has also been making bold statements to add spice to your wardrobe. For those unfamiliar with Ki6, it is a brand from an Italian town called Via Nuova Ponente. They are well known for choosing natural fabrics and illuminating them with sequins and rhinestones. For AW’14, they’ve chosen to add the luxurious feeling of fur collars to add warmth a twist of the decadent. I’m in love with this ‘thousands & millions’- like necklace that I happen to stumble upon my trip to Barcelona this summer at Sfera. For those of you who aren’t familiar with this brand, it is a women’s, children’s & men’s fashion retailer from Madrid. Style and price point is rather close to Zara. Do you really know how to work Twitter & do Tweets! Well, if you're an expert then this weekend pop on over toCovent Garden's East piazza and start tweeting for the sweetest treats at the Marc Jacbos Pop-Up Store. The whole of the shop is decorated with scenes of rolling hills with daisies.....And there are purses, handbags, sunglasses and other MJ goodies up for grabs. To get these you have to use the hashtag and tweet. Each day the most interesting and creative tweets will be chosen, and then the person can go back to the shop and choose their heart's desire! Remember: NOTHING IS FOR SALE, and your money is not good in the shop. Instead, trade in your tweets for the treats! I got my 50ml bottle of the newest Daisy fragrance this morning....This event is not to missed as it is a bit of fun & excitement this weekend! Find the Marc Jacob's Pop-Up shop at 4 East Piazza, Covent Garden. 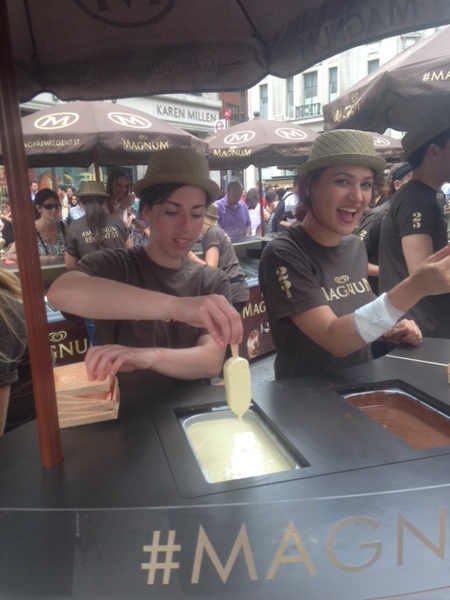 Celebrations For Magnum's 25th, Regent St.
Did you get a chance to celebrate Magnum's 25th birthday on Regent St. Sunday July 27th? 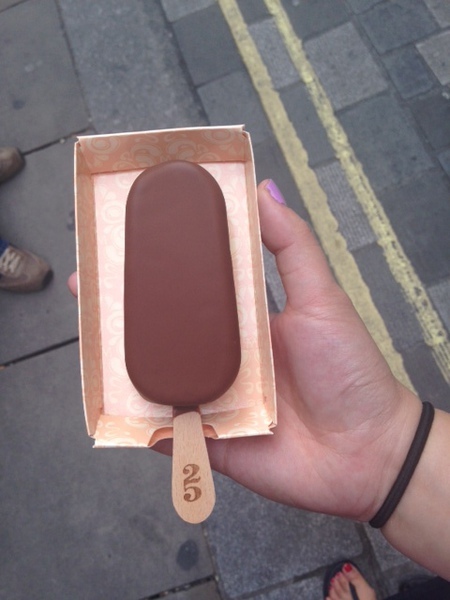 To celebrate, Magnum's had 25,000 bars of ice cream to give away. The lines were nothing like I've seen before except perhaps at Disneyland. Choice of milk chocolate or white, the ice cream bars were hand dipped, and hence were not as crunchy as normal Magnum's, but nonetheless refreshing in the summer heat. What a treat! I happen to be within the area on the day....and made my way after lunch.....it was one of this summer's tastiest....and most decadent treats! Beauty has been keeping her lips sealed tight! It’s not what you think though, as she’s not about to burst having kept a secret for someone. She’s been using a most unusual beauty product from DHC: Revitalising Moisture Strips for The Mouth. Sometimes the first signs of aging creep up just at the corners of the mouth or above the lip. For those who are naughty and have been smoking- beware! Sachajuan: Internationally acclaimed Swedish hairdressers Sacha Mitic and Juan Rosalind are the brainchild behind Sachajuan (hair care). Having launched their salon in 1997 the pair are considered to be the HOTTEST hairdressers inSweden. Their range of hair care- Sachajuan lauched in 2003 and has had been raved about and showcased in magazine shoots including Vogue, Elle, Glamour, Allure, Amica and GQ magazine. They claim that their secret formula lies in Oceansilk technology- a combination of algae that has healing effects on the hair. I’ve trailed several products within this range, and I think it is worthy of noting it down for those who are looking for more high performing hair products. I suggest those who colour their hair to definitely give the colour save shampoo and conditioner a go, as it is gentle but effective in that squeaky clean feeling without the feeling of having anything stripped. Also both guys and dolls will appreciate special products like the Spray Wax that holds and moulds like wax without getting your fingers sticky. Want to hold it, or style it, just spray and away you go…. Olverum: Hard day at work? Need some sort of respite? Well hop into the bath with some Olverum Bath Oil. This oil works fast to ease aching muscles, and any rheumatic pains. If you’re sick or even have clogged sinuses due to allergies and the like, give this a go as it can get you breathing again. I love it because it releases all the tension and stress of the everyday and puts be right to sleep. I suggest it also for those who have those niggling headaches in the evening after work. Beauty Says: During my most recent visits to Percy & Reed with beast, we have been tempted not once, not twice, but many times by a new signature in haircare: ORIBE. Why? Well, just to list off a few of the reasons namely being that Oribe haircare is sulphate free, lightly scented, UV protecting, color and keratin treatment safe, sodium chloride free, and has the top-level of technology and natural actives available out there in their bottles. The name is pronounced ‘OR-BAY’ (please don’t pronounce it as some would pronounce filet mignon- filet mig-nun). Oribe is a renowned celebrity hairstylist that has been deemed to be one of the top hairdressers of all time. This of course, does not go to Mr. Oribe’s head. Having had his work grace the editorial and campaign work, and covers of Vogue, Elle, Allue, W, and V Magazine, he still believes only in one thing: a love for this work: hairdressing. Hence, he does this all too well. I heard down the salon grapevine that he originally only developed this line of hair care for his personal clients but soon found it high in demand and produced it on a retail level. Luckily for us then, that our strands may stand up and sign off each date night, party, and encounter with a new signature. There are five collections of haircare-from the everyday in the Signature range to Volume, Shine, Color and Taming. My favourite? The Signature range. Rich but light, the Signature range can be used by everyone, everyday; and you may think of it as what the French call breakfast- a ‘petit de jeuner’ for hair. It gives the most luxurious lather but when rinsed it is weightless. Using some of the most natural and what may appear to be simple ingredients such as coconut, corn, and oat derived cleansers to prevent stripping; lychee extract to protect from oxidative stress, photo-aging and deterioration of natural keratin, every day hair washing can be like walking out of the salon every morning! I’m most impressed by the vegetable derived humectants that help to attract natural moisture to the hair, and edelweiss flower extract to fight against drying and color-depleting effects from the elements. I truly believe that a key element as such has been helping my hair stay calm through all the recent humidity. My suggestion is to indulge and invest in some Oribe, as after this it is safe to say, there can be no bad hair days. They also make anti-humidity sprays, and other great styling products that can help you look picture perfect. This is no beauty myth, as Oribe products have been called ‘The Fountain of Youth for Hair’! Beauty Says: Although Summer’s heat is still here, don’t forget that September (and autumn) are right around the corner. Transitional periods are tricky and often hard to tackle when it comes to skin. On one hand, you have to change your moisturiser, and on the other hand, you may have a hard time balancing out your foundation colour not to mention also the formulation. Well this year I’ve found the solution in two great products that tackle and answer all the headaches of transitional skin: Chantecaille’s- Future Skin Foundation + La Crème De Rose De Mai. This summer I’ve been using a BB cream for the most part as I’ve found it to be the best solution for balmy conditions throughout the day. As I was getting to the bottom of the compact, and had thoughts to replenishing, I stopped myself because a second thought occurred to me which was that Autumn and change in the weather and my skin was just around the corner. I started researching on brands I often use, like and stumbled across Chantecaille’s Future Skin Foundation. For the upcoming season I’m recommending Chantecaille’s Future Skin Foundation as the answer to end all woes of transition from one season to the next. Why? Well to start, the foundation is oil free, and contains 60% charged water & seaweed. It has the ability to seal in moisture and improve the texture of your skin. The secret is in an ingredient called ‘Nattogum’- a phyto-collagen derived from soybeans. It has been trailed and tested that within a 7-day use period 26% of sebum in the skin is reduced. This is excellent news when skin is in the transitional stages between seasons, as there might be more sebum production as the skin adjusts from one season to the next. This also means that with sebum reduction blemishes are kept at bay! Another main advantage with this foundation is the adjustable coverage. It contains reflective circular pigments which allow a medium to full coverage. Finally, I give it the all thumbs up for the third and final benefit (this should be deemed the hat trick foundation) of it being able to prevent water evaporation, meaning it stays on the skin moist which equals no caking. To prove the results all you have to do is turn your head to avid fans of this product such as Blake Lively, Kristen Stewart, Bono & even Bon Jovi! With weather change rule of thumb is not to use a heavy cream (as you want to prevent spots), but still use something nourishing to the skin. There are very little moisturisers out there in gel forms that will be able to perform both these tasks at hand. Chantecaille’s newest and most recent launch- La Crème De Rose De Mai is rather a smart moisturiser that can help our skin make a smooth transition from one season to the next. Why? Well to begin it contains sweet pea steam cell, an ingredient that boosts skin’s innate ability to clean and recycle. The texture of the moisturiser is light-weight, but when you massage it in, you can in fact, feel that the skin has been well nourished. It has a smooth finish, and what I like best about it is that it just disappears. Snob Says: The old adage ‘You are what you eat’, could not be more true when it comes to my most recommended restaurant group, in Barcelona, Grup Xativa. Their ethos and conscience of food, from their organic ingredients to allergy/intolerance specific menus, redefine the term: ‘fine dining’. All three of their restaurants in the heart of Barcelona’s city centre are just as dynamic as the other, and gives you not just a wholesome food experience, but also one that is fulfilling inside and out. The story of where the original recipe for L’Arrosseria Xativa is charming as well as fascinating. Xativa is small town or city in proximity between Valencia and Alacant, Spain. It was here in this small town that the current proprietor’s mother learned a unique recipe for cooking paella with fresh sea water from the locals. After many years, she migrated and married in Barcelona, and therefore brought this secret recipe up north to Catalonian country. All the paella that is cooked in the restaurants is cooked with sea water that has been filtered three times through special equipment. The paella rice is all organic and there are over 30 varieties that are used to create all the different paella dishes on the menus. *** Top tip: To truly savour the flavours of Arrosseria’s paella dishes, be sure to ask for a wooden spoon and eat with this. Rumour has it that the wooden spoon experience changes and heightens the flavours and experience in texture. Can You Commit One of 7 Deadly Sins At Lucky Seven? Snob Says: We often feel guilty about ordering naughty treats when we go out to eat, and often promise that ‘we will diet tomorrow’, but in the whole of August you won’t have to feel guilty about any sins you might commit! Notting Hill’s Lucky Seven Diner, famous for being a neighbourhood East Coast American style eatery, will be allowing you to indulge with the introduction of their Seven Deadly Sins menu. Every Monday through Thursday, until 7pm, guests will be able to select scrumptious dishes such as Huevos Rancheros, Pulled Pork Sandwich, Green Chilli Cheeseburger and Confetti Lentil Melt, for a mere £7! Snob says: Stuck for inspiration on where to go for Sunday Brunch? Want good food, at affordable price, that is delicious? Well look no further than Kingly Court’s newest addition: STAX. The décor of this tiny venue is fun and is inspired by country diners towards the American South. Serving, more than generous, portions of buttermilk pancakes (choose from raspberry, blueberry, strawberry, or plain) with real maple syrup on the side with a dusting of powdered sugar, you’ll truly feel you’ve hit down two stones (breakfast & lunch). I suggest the highlight of trying out more unusual dishes like the Fried Chicken & Waffles combination. This dish was a dream come true for me as I can never make a decision between sweet and savoury. Well, in this case I didn’t have to. The chicken was marinated with a hint of spices, and still juicy, not dry. Eating it in combination with the waffles and maple syrup made want to do a genuine ‘Yee-Ha’ at the end of my meal!